Located minutes away from Ubud centre, the 12 T Houses are a unique community in a beautiful setting with guests from all over the world. Enjoy the privacy of your own space or mix with interesting people, make new Balinese and international friends. Chai is a two storey two bedroom house with use of a beautiful shared pool. It has one bedroom upstairs with great views of the pool/rice fields and one bedroom downstairs in a separate pavilion. It has two Balinese style open air bathrooms, a large kitchen, spacious seating areas and can accommodate up to 4 adults and 2 children (sofa beds). A baby cot is also available upon request. During your stay, you will experience a serenity that cannot be found in central Ubud. There is a beautiful swimming pool (with children's pool area) beside the rice fields. This is shared with the other T houses and there is always a quiet time for a relaxing swim. Daily maid service, free wifi (good connection) and basic breakfast is included in your stay. As maids have to juggle a few houses, they might not be that punctual. The house offers you an experience to stay in an environmentally friendly and ecologically sustainable compound, which is a part of Balinese village life. The house is for people who love to meet other people, kids usually make new friends when they stay here. Chai House is a 5 to 10 minute drive from Ubud centre and 10 minutes from the Monkey Forest. It is located just outside of the picturesque town of Ubud, famous for its food, views and cultural attractions, including striking waterfalls and temples. The setting offers true tranquility as it is set away from the town with a few restaurants close by. The staff are available to make you an evening meal upon request using fresh local ingredients (order 1 day in advance). We have a fantastic local driver who will bring you from/to the airport (or other location) at very reasonable rates. He is highly recommended, with good English speaking and an exceptional knowledge of Bali; he can create a unique experience of the island for you. Guest feedback: "Honestly, don't waste your time thinking you want to take yourself everywhere and find it on your own: you'll never find it. He will save you loads of time and stress and is a genuine great guy." They can also arrange other services such as massage, laundry and freshly prepared local food (please order one day in advance). Rates include all taxes/service charge, breakfast, wifi and daily maid service. Airport pick up is additional charge. Set up as an indoor/outdoor experience, you live close to nature and will have daily visits from ducks, frogs and geckos. Please appreciate the natural setting of the house. Ubud is arguably the best place to use as a base if you're visiting Bali; if you're looking for culture, comfort, nature and inspiration. Ubud is surrounded by most of the things that bring people to Bali -- scenic rice fields, small villages, art and craft communities, ancient temples, palaces, waterfalls and much more. And it's central location makes it easy to get from Ubud to the mountains, beaches, and major towns. Socialising is never so easy as in the T-house. Great for families with kids. We look forward to welcoming you at our property! Bicycle free for guest use and motorbike available for rent. Contact the T-House staff for more information. If you love glam ping, this is the place for you. Beautiful setting, pool gorgeous. We loved the Chai T house, it was like ritzy glamming with the open style accommodation. Complete with lots of frogs, lizards, butterflies & some friendly cats & dogs. The kids were not impressed when it started raining & water was running down the wall inside their bedroom & frogs visiting them most nights. The carpark was right behind their bedroom so was noisy when people were coming & going, open rafters so you can hear everything. Not so bad in the master bedroom upstairs, you tune out after a couple of nights.The staff were great, very helpful & genuine. Lovely breakfast cooked in our villa every morning. Lovely rural outlook over rice paddies. I would stay here again, leave the children at home!! Loved the country location! The staff was very helpful and friendly. The people in Ubud are lovely, gentle and gracious. Thank you Gail for your review! We are happy to hear you enjoyed your stay with us and hope you will visit us again soon. 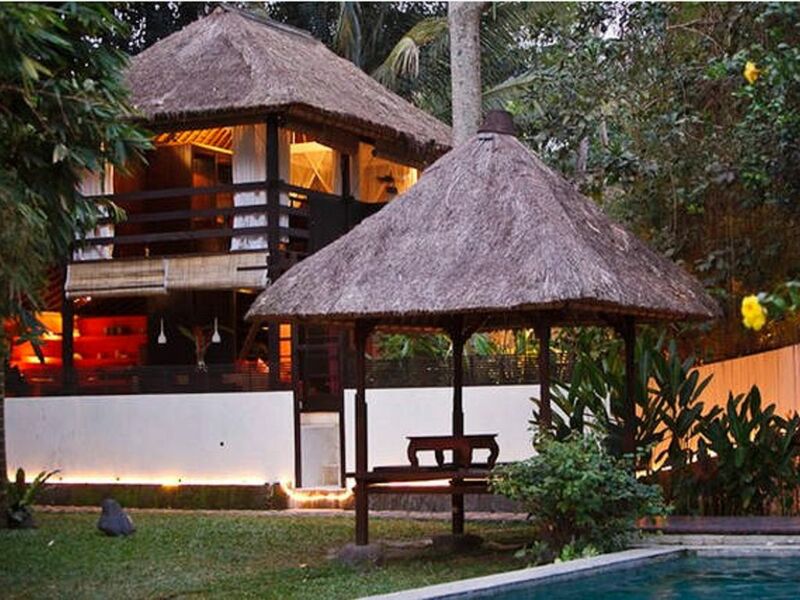 THouse is located coviniently in the rural setting of Ubud. We walked to Ubud and it took us 30 minutes of an interesting march. Walking through the village and fields is a pure pleasure but one you get to the main road the real challenge begins as footways are very narrow and full of open holes to storm water channels. Taxi from /to Ubud 30,000 RP. Accommodation is a perfect personification of Balinese spirit. Garden, courtyard, house are tangled together and fluid. Open air bathrooms are a fascinating cultural curiosity which we enjoyed very much. Ground floor room is more European style:with walls, glazing and TV. The first floor bedroom is a Balinese interpretation of it: open to nature, stunning sunset views. Both rooms have big fans and mosquito nets. And we found that it is sufficient to feel comfortable. It was a bit loud at night due to the surrounding nature. Froggy rap accompanied by cricket drum section became our favourite music. Breakfests are freshly prepared by lovely ladies. You just open the door in the morning and they come relatively soon to make typical breakfast food: eggs (scrambled, fried, omlet or pancakes), toast, fruit and Balinese coffee. Perfect start of a day. Swimming pool is clean, comfortable, with a shallow section for children. It is long enough to have some meaningful exercise. Tranquil views over the rice field. Stargazing recommended. Gerry recommended Putu the taxi driver for the airport transfer and we also asked him to give us a tour and drive us to Amed. And indeed his services were also excellent. He speaks fairly good English, knows places so can suggest routes if you give him your objectives, talks but also gives room for private conversations. We were so happy that we employed him multiple times. Overall we had wonderful time and THouse was an integral part of the experience. The staff on the compound is great. Apart from doing their job well, they also are very helpful in non standard situations such as assisting in changing the cooking class booking or treating the wound. THANK YOU!!! Wonderful place to stay by the rice fields! We absolutely loved Chai House! Such a gorgeous little Balinese-style wooden house, full of character with comfortable beds, spacious feel and lots of seating/dining areas, plus open air bathrooms – showering under a beautiful Ubud sky surrounded by bamboo and coconut trees, unforgettable experience!! The pool is really nice and it was so relaxing/serene swimming right next to the rice fields, especially in the early evening before sunset. We saw local children and villagers passing by through the rice fields; such a unique and authentic feel being so close to traditional village life. Putu the driver was great, he was waiting for us at the airport with a big smile and took us on an adventurous day trip (he will tailor to what you like to do); we also rented a motorbike from the T House staff and drove into Ubud town (very busy!) which was 10 minutes’ drive away. If you enjoy being close to nature and seeing the real Bali, I would highly recommend a stay at Chai House. Thanks Gerry! Negatives: Breakfast was a bit on the small side, recommend to ask for more toast! or buy extras (ham, sausages, etc.) from the local supermarket to keep in the fridge and ask the staff to cook. Coco Supermarket is open until 11pm and has everything you could need! at heeps of other places un Ubud. be full in the morning! My family had a wonderful time at the Chai T house. All communication with Gerry was quick and easy. The house was exactly as described. We loved the open air feel and were perfectly comfortable. We made use of the fantastic pool every day. We also enjoyed meeting the other families staying in the compound, everyone was so friendly. The staff was always helpful and pleasant. We were especially grateful for Putu, our driver. He picked us up at the airport and drove us all around Ubud. He took us to so many interesting places, telling us stories and describing life in Bali all the while. We thought it was the perfect accommodation for a laid-back family. What a lovely place! I was really sad when I had to leave because his place is something really special. The women were just harvesting the rice next to the property, people are so incredible friendly and helpful and Putu as a guide and driver is just invaluable!!!! The pool was so nice that I went every morning even before breakfast for a swim, and it gives you the feeling you are swimming into the rice field. The staff is very helpful, and we have really enjoyed the Indonesian cooking class. I love the T-House and I am sure I will come back next year! Even my daughter who is just 18 and normally in a party mood has really enjoyed it. Ubud, a town in central Bali, is far removed from the crowded scene in Kuta, and is regarded as the cultural centre of Bali. It is famous as an arts and crafts hub, and much of the town and nearby villages seems to consist of artists' workshops and galleries. It's a place for contemplation, walking, biking, not to forget shopping and relaxing. Massages, spa's and yoga, it's all there in large quantities and qualities. There are some remarkable architectural and other sights to be found, and a general feeling of well being to be enjoyed, all thanks to the spirit, surroundings, and climate of the place.